Suitor stepped forward significantly from his jumping bow to land the Adare Manor Opportunity Maiden Hurdle at Limerick. Rated in the 70s during his career as a middle-distance handicapper on the level for Brian Ellison, the son of Dutch Art was third on his NH debut at Down Royal last month. Odds-on favourite Sympa Des Flos set sail for home a far way out and had them all on the stretch turning in, but Chris Meehan hadn't asked for maximum effort and when he did, Suitor (8-1) responded to score by nine lengths. Trainer Gordon Elliott said: "He (Meehan) said he was flat out early and he jumped great. The further he went the better he got. "We bought him as a dual-purpose horse and he should be a fun horse and they've (winning syndicate) had a winner now so they're delighted!" Shauna Larkin advertised her skills in the saddle with a hard-fought victory in the Britain V Ireland (Q.R.) Challenge Handicap Hurdle. After taking it up before two out, the 7-4 favourite looked in real danger when challenged by Ali Bin Nayef, but Larkin threw everything at him and he crossed the line with half a length in hand. Trainer Dermot McLoughlin said: "He is consistent and will go for something similar in a few weeks' time. 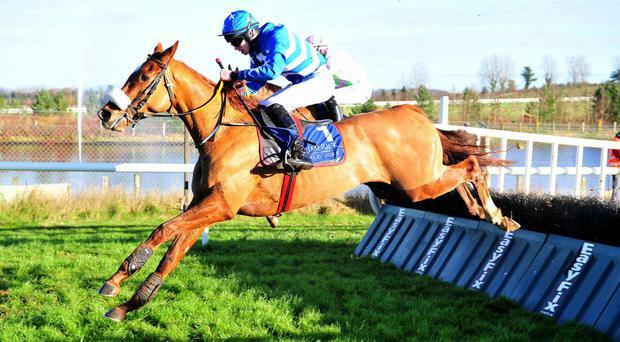 "He was unlucky to be beaten a nose at Wexford the last day and seems to thrive on that ground. "It was pot luck that we got Shauna as it was a Challenge race and it was her first time riding for us. She'll ride plenty more winners." Larkin, riding her first winner under Rules, said: "I've also had six point-to-point winners and I'm thrilled with that, it was deadly!" Motown Girl rounded out proceedings by justifying 6-4 favouritism with ease in the Follow Limerick Races On Twitter Mares (Ladies Pro/Am) Flat Race for Mags Mullins and Katie O'Farrell.